Well SDCC has come and gone yet again. The most anticipated show that everyone waits for year after year. For those who have never gone, there are lines literally for everything inside & outside. Besides the convention exclusives & panels, there were lots of off-site activities to do which kept most if not all busy for 4+ days and sleep was pretty much very few hours a night to none at all depending if you went to programming at night or were invited/had tickets for parties and other events. (word & picture slideshow heavy) Sorry for the delay in getting this up! If you're not keen on reading just look for the slideshow galleries towards the end lol. 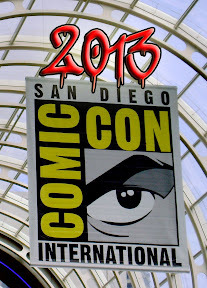 If you can manage this long post - At the end of the post are Picture Galleries for Super7, Gargamel & Grasshut, Designer Toys, Toys & Collectibles, Inside & Outside SDCC #1 & #2, A few pics from Funko Fun Days, WB The Big Bang Theory Art, Bates Motel / Vikings etc... Didn't make any comments for these but will make a new post featuring our SDCC Haul and freebies that we came home with. Lets start with Preview Night. Preview night is just as busy as any regular show day. You get in line to pick up your badges then you get in another line to either get into a panel, the exhibit floor or tickets for autographs, exclusives etc... Then the waiting begins depending on how early you get in line. Doors don't open until 6PM. When the time is near for the doors to open, the line security will pack you in like sardines and once the doors open, the line starts moving & everyone cheers. You then head down the escalators and make your way into the exhibit hall. Once you make your way through the doors, there are crowd control people telling you there is no running in the exhibit hall. What can one expect on Preview Night? The main thing is people are hoping to score is all their main exclusive wants within the few hours as there are less people than say on Thurs-Sun. No surprise that Funko had an enormous line from their rear back corner all the way to where the entrance to get into the exhibit hall is. Funko had over 50 exclusives and the range of exclusives appealed to just about everyone.The biggest surprise was the huge line for Super7 and in large part was due to their much anticipated Alien ReAction Figure 2-Pack release Exclusive. Alien fans have been waiting decades for any company to make these. Not only was the 2-Pack Exclusive released but fans also got a chance to pre-order the Alien ReAction 5-figure Set which included a Special Early Bird Package just for those who pre-ordered at SDCC . What other hot exclusives were there? As usual Mattel, Hasbro, Neca, Hallmark, Lego etc... all had their own enormous lines. Another surprise was the Uglydoll x Hello Kitty Collaboration exclusives at the Uglydoll booth. Lines were long and Uglydoll was pretty much sold out of most things by Saturday. They did try and hold a few things back for Sunday but not much if anything was left. I would say the rabid fans of Uglydoll & Hello Kitty made this a huge success for both companies. Speaking of Hello Kitty, another line you were probably in was Toynami to pick up their Sanrio x Street Fighter Exclusive Hello Kitty Akuma Plush or Badtz Maru Ryu Plush. If you weren't in line for any exclusives you were probably in a line for freebies. Who doesn't love free stuff? So Preview night came and went. On to the full days ahead of Thursday-Sunday. If you needed to attend a panel in Ballroom 20 or Hall H you needed to get in line super early especially if the panel you wanted to see was extremely popular like The Big Bang Theory, Doctor Who, True Blood etc.... Other reasons why you need to line up early was to get in line to get tickets for Autographs/Signings as well as Toy Exclusives from Hasbro. There are some who even lined up super early just to be one of the first ones waiting to get into the exhibit hall which didn't open until 9:30am. When it comes to standing in line to get exclusives, Kidrobot did an amazing job with how they distributed wristbands with staggering times so their lines for exclusives doesn't block other booths. It also helped that you didn't have to wait in their lines for hours just to try and get something while missing out on things elsewhere. Kidrobot was one of the companies who used to have to deal with enormous lines for their exclusives and they figured out a way to make things go smoother for their fans, themselves and not getting yelled at by the security people. Every year, lines are always an issue but it's nothing new. Thursday was the day to check out all the cool displays that companies put up. The Walking Dead had a pretty huge presence both inside and outside the convention center. Inside they had a prison wall up with live zombie actors and of course you can get your picture taken. They had another Walking Dead set up in the Video Game section which moved all the way to the other side of the convention center. Outside the convention center they had The Walking Dead Escape at Petco Park and across the street they had their photo op with Zombie Actors roaming around and waiting to attack you when you least expected it. Adventure Time had a really cool Ice King setup where you could walk in and get your picture/video taken inside while getting a cool Adventure Time Pin. They were giving out different ones each day. If you didn't want to walk through the Ice King you could go through the "fast lane" to pick up your pin. As cool as everything was inside the convention center there were so many off-site things to see and it's always great to get some fresh air too. Let's start with the Interactive Zone at Petco Park. First thing you noticed while walking on the pedestrian bridge is a huge inflatable Smurf and the Adult Swim Inflatable Fun House. Once you walk inside the area, there are quite a few things to see and do there. There was a Mad Max area where you could get makeup painted on your face, the inflatable village of Smurf houses. Then you hit the Walking Dead area where there is a car readily available for you to get your picture taken in unless there was a zombie walking around. One of the vehicles from the Course of the Force was parked there. Sanrio made their first appearance at SDCC. They had their own little boutique set up where you can buy their Hello Kitty Exclusives. There were food trucks, the Adult Swim Inflatable Fun House (sadly did not have the time to experience) and DC Justice League x Kia We Can Be Heroes. The Kia cars were customized as various Justice League Characters such as Wonder Woman, Superman, Batman etc... They were done by West Coast Customs & Jim Lee did the final touches on the Justice League Kia Car on preview night. Not only were there customized cars but there were lots of original artwork. Across the street there was a 5 Hour Energy booth setup along with the Elders Scroll Online truck/booth which was setup on Thursday and they were giving out Pints of Ice Cream.